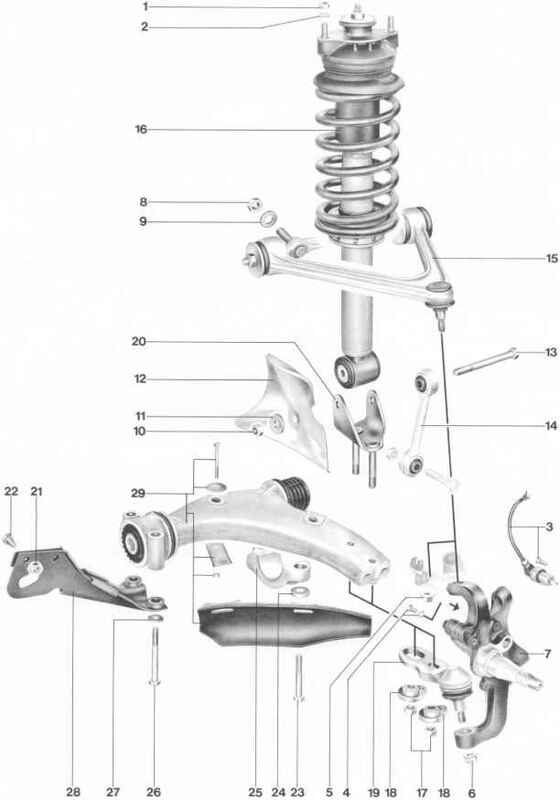 Independent suspension, double control arm with coil spring and internal damper. Only for Boge gas dampers. see pages 40 - 19 and 40 - 20 for position and types. inspect for damage. No reworking is permissible. If necessary (to increase working space), remove bearing clamp No. 25 of lower control arm. When removing bearing clamp, slacken lock-nuts No. 17 on caster and camber eccentrics. * There is no difference between No. 5 and No. 6 (collar dia. approx. 24 mm). In some cars, a nut (No. 5) with a collar dia. approx. 26 mm was fitted to the upper joint (to use up stock). when replacing, do not confuse with version for cars earlier than 1986. Spare part number on linkage. Tightening torque for upper and lower mountings : 85 Nm (62 ftlb). Install right way round. 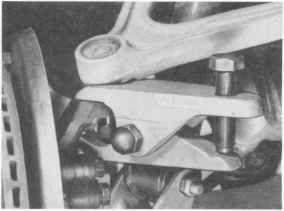 Cranked end at top (at spring strut mounting) and tilted forward (no difference bewteen left-hand and right-hand parts). inspect, renew if necessary. No reworking is permissible. Attachment to body: lubricate thread and shank with Opti-moly HT. coat sliding surfaces of eccentric adjustment range with Opti-moly TA. 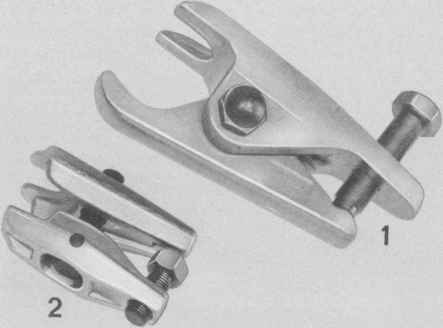 Cover slots of ball joints, page 40 - 23. 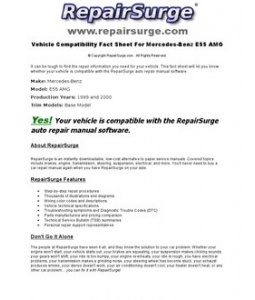 When replacing, note page 40-21.
when replacing, do not mix up with version for cars earlier than model year 86. See page 40-21. After inserting in lower control arm, coat thread with Optimoly HT. Do not allow Optimoly HT to touch shank of bolt or to penetrate hole in light-alloy member (see page 40 - 14). coat thread with Opti-moly HT (Optimoly HT on bolt shank is impermissible). * Screw in until only 2 threads are visible. Do not tighten to 120 Nm (88 ftlb) until assembly is completed and springs have settled. check for damage. Tighten as specified. 3.Press out track rod with extractor, e.g. Nexus 168-1. 2.Disconnect ground lead (86 models onward). Remove speed sensor. 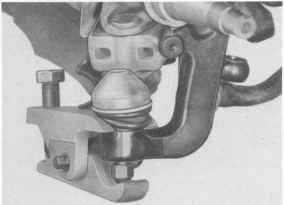 1.Unbolt brake caliper and move aside without imposing strain on brake hose. Beforehand, open plug-in connector of ABS and brake-pad wear cable and disconnect. 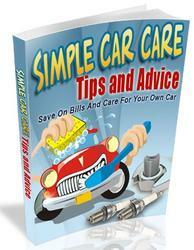 4.Use VW 267a to press out ball joint. Take care not to damage protective caps of joints. 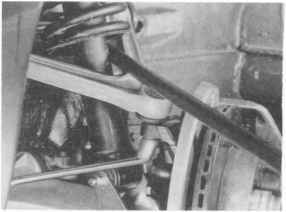 (Steering knuckle with cap nut, see page 40 - 25). If collar nuts difficult to remove, see Installing, Item 3. 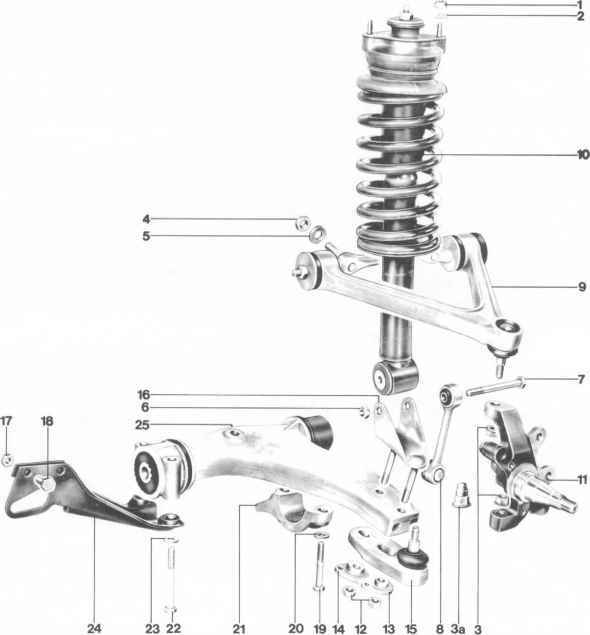 Wheel suspension, 86 models onward (lower bal1 joint). For steel-steel threaded connections and contact surfaces of assembly parts. Never use Optimoly HT on contact surfaces of steel to light alloy, as moisture will produce corrosion. When applied to threads, this lubricant has no effect on tightening torques. For all connections with aluminum or with magnesium, for corrosion protection. When applied to threads, this lubricant has a slight effect on tightening torques. 1.Subject all parts to visual inspection, if necessary, compare with new part. 2.When installing lower control Close slots for outer cams (page arm, screw bolts of rear bearing 40 - 23). clamp into body until only 2 threads are visible. 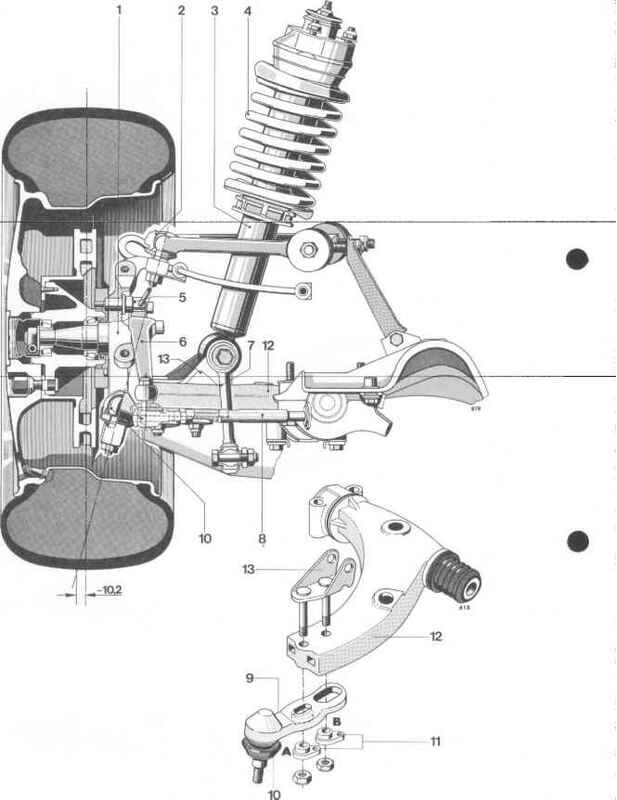 specified torque until assembly is completed and springs have settled. This keeps front of car down. 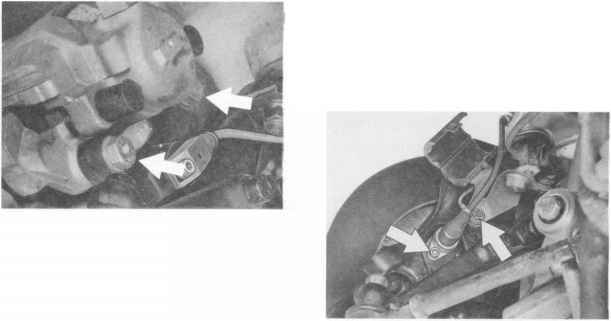 3.To prevent ball pins turning and to allow installation of collar nuts (also for disassembly), apply pressure to upper control arm to load ball joints. 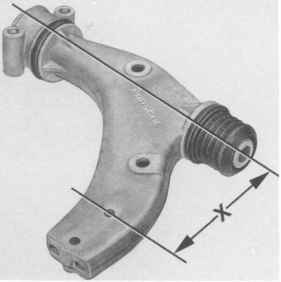 Spray adjustment plate on lower control arm with eccentrics, threaded section of track rod, threaded pins in upper bearing joint and threaded pins in lower bearing joint with Tectyl-UL 846 (Valvoline). This prevents corrosion of the threaded elements, thus facilitating maintenance and repair work. How open upper control arm nuts at porsche 928?